I wanted to take the time to show you two rather interesting elements of Wealthy Affiliate. Many of you are probably entertaining the thought that Wealthy Affiliate just isn’t the program for you. You hear Wealthy Affiliate and you think two things: money pit, too advanced for me. Here are two reasons why you should be thinking otherwise. A recent survey conducted here at I’ve Tried That has shown that the majority of our readers are interested in working from home, meaning that you want work to do and you want to be paid for it. One of the less advertised feature of Wealthy Affiliate is the job board. On the job board, WA members can post freelance job requests for other members. Jobs generally range from writing to technical work to graphic or web design. Below is a screenshot of the actual job board as of this morning. There are currently 182 open opportunities waiting to be filled. Most of which have been posted within these past few weeks. 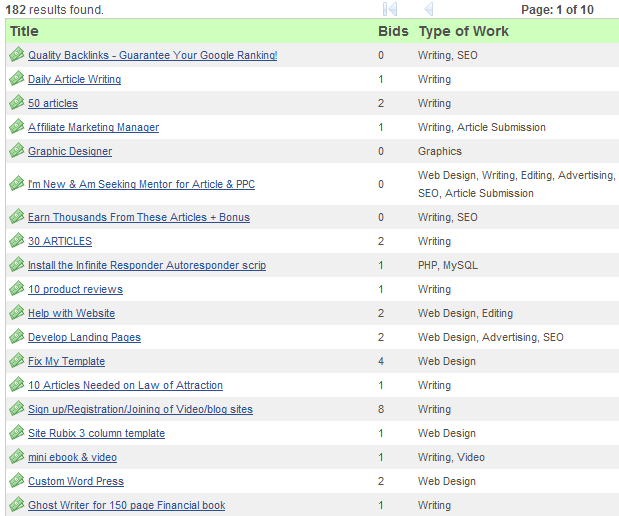 As you can see, there isn’t a ton of competition considering the number of bids being placed. If you’re looking to make some extra money, the Wealthy Affiliate job board can help. You do need a membership to the program to access it. Your membership will grant you full access to Wealthy Affiliate. Who knows, you could join today to pick up some freelance work and find the information they offer to be so valuable that you turn into an internet marketer overnight. Click here to learn more about Wealthy Affiliate.. The Wealthy Affiliate Forum is by far the best forum I’ve ever seen when it comes to making money online. There are over 25,000 members all with the same goal: to make as much money online as possible. I’m showing you the Success Forum because I want you to see real experiences from real people. These people are merely talking amongst themselves about the success they’ve had with Wealthy Affiliate. They aren’t selling anything. They are merely retelling their success stories for other members. There are over 2,500 posts in the success forum. The following is just a small snippet of post titles. There are two posts in particular that I wanted to show you. Again, these are actual testimonials from actual people. The first testimonial is a phenomenal success story. I’d say this isn’t your average case, but it shows the true potential of the Wealthy Affiliate program. From Zero to $500+ Day – My success story! Some of you know me, and some of you don’t, so for those who don’t here is a little background on me and my Affiliate Marketing venture! 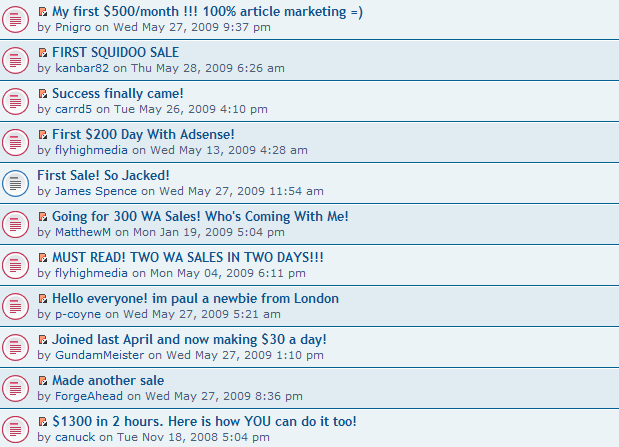 You see, I joined WA In Nov. 2007 and this was going to be the very last try to make money online! I had a successful business before, but earning online was a total unknown to me! I tried few things, but without the success until I found Wealthy Affiliates! Thank you Kyle and Carson! Just to give you some idea of how new I was: I had NO idea how to get my link to say “click here” :D It is funny now, but at first it was really frustrating. In addition to this, I spent 1 full week trying to get the video embedded on my site. And keyword research was so confusing, that much so that I was stuck on that point for 2 months. But even so, with all the struggle, I made my first sale 8 weeks after starting WA membership. And since than, I had ups and downs, but I NEVER Gave Up! That is the key to your success too! Don’t give up otherwise you will never learn how to succeed! I will tell you this too! Stop subscribing to those “get rich quick” programs, they don’t work either, what they will end up doing is confuse you even more. What really works is using the information provided here, in this forum and putting it into action. The more you do it, the more you learn, and the better you become! I see many people here saying, how do I make that first sale! And here is the advice for you! Just connect the person with the product! That is all you have to do! People have issues all the time, I know you have issues too! Your only job is to solve that issue! The keywords are second step, the first step is that issue! Don’t get stuck on weight industry if it is not going your way! Find what works for you! What you are into, or your kids are into! There are many ways to make money online, you just need to find the way it works for you! By the end of my first year, I had many $500+/ days. Now many are going to say WOW! That is cool! That is Great! I wish I could do this too, but life is getting in the way! I don’t know if you noticed, at the beginning I said “My successful business” before was earning me 100K plus a year, and in few months got me down to earning NOTHING! My husbands salary could not cover our expenses, and we had our two children to take care off! Thanks GOD we were smart enough to save some money, but that was going away fast. So with a full real life crises on my shoulders, the recession knocking on everyone’s doors, I was so determined to make this work! And I made It Work! Get the plan, stick to it, and it has to happen! English is not my first language, I was not born into the money, I immigrated to United states with full $100 bucks in my pocket, but I have a will, clear head, and now I have a way to earn as much as I want and the ability to live a life I want. My goal for 2009 by summer was to be living in Croatia (as some of you know), I am moving to my new place in two weeks! The second success story comes from a Wealthy Affiliate beginner. Within 3 weeks, this member went from knowing little about internet marketing to pulling in over $500 in sales. After three weeks with WA…over $500 in sales!! I want to share with you my experience as an internet marketer. I have been internet marketing for about nine months with barely any success. I know the potential is huge… but I was missing something. I had no plan of action, no real direction…I was just running around like a chicken with its head cut off. So one day I find WA and immediately recognize that this place is what I need to learn the things I need to learn. So after one week I start to do some research the way it is taught and to do some bum marketing. Well in the last two weeks I have made over $500 in sales, which amazes me because I have barely scratched the surface of what is possible. Guys and gals….keep on learning. Try to learn something NEW everyday. Try to improve on something every day, even if that something is really small. Those small gains really end up paying off. Now, I realize I probably got a little lucky but if I can do it anyone can. At first things will seem totally confusing, that is why I say to take small steps. Remember, the journey of a thousand miles begins with a single step. Keep putting those steps together in the right direction and you WILL get where you want to get. Bum marketing is so incredible to me because literally anyone can do it and it doesn’t cost anything! Then build upon that. Do NOT give up! These are two stories among thousands. I hope this post gave you a little more insight as to what the Wealthy Affiliate has to offer. I’ve been a member for over a month now and I’m already seeing tremendous results in terms of income and traffic with the program. Joining Wealthy Affiliate has been one of the best investments I’ve made since I’ve launched my Internet Marketing career over three years ago. I just wish I had found about it sooner. Don’t wait and make the same mistake I made! Click here now to learn more about the Wealthy Affiliate.